Alfie was 2 years old before he took his first trip to the cinema. Eli is only 7 weeks old and he’s just had his first cinema trip. I did a poll on Instagram and Twitter to ask what people thought to taking a newborn to the cinema. The results were fairly evenly split. It was interesting to read some of the comments people had left or messaged me. Some said get some baby ear defenders. Others said go to a baby/kids screening. 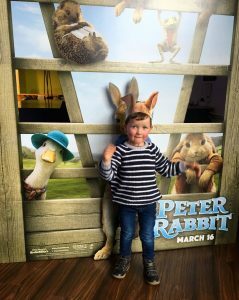 Alfie was desperate to see Peter Rabbit and we also wanted to see it. As I’m breastfeeding I’d resigned to the fact I wouldn’t be able to go. However, a few people suggested taking Eli in the sling and baby wearing our way through the film. It was the perfect solution. Eli was in the sling, cooed over by the staff, and blissfully unaware. I was slightly worried about the noise. It was quite loud when we first went in, but he didn’t even flinch. In fact he only stirred, ever so slightly, near the end of the film. He stayed asleep through it all. I don’t think you’ll be getting a review of the film off Eli any time soon, but we loved it. 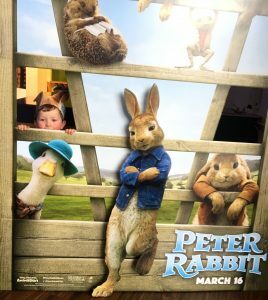 It was a great all round family film. I’ve got to say it was much easier than I thought it would be. But that could be a fluke. Would I take Eli to see something again? Yes. We love kids films and whilst we can take him, we will. Once he is mobile it may be a different story and we may have to wait until he’s interested in watching films. 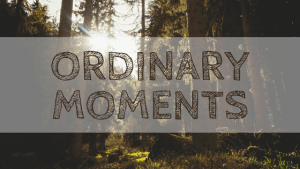 I’m joining the lovely Donna over at What the Redhead Said for this weeks Ordinary Moments.